HMAS Sleuth was originally built as the steam yacht Ena during 1900-01 for Mr (later Sir) Thomas Allwright Dibbs, General Manager of the Commercial Banking Company and Commodore of the Royal Sydney Yacht Squadron. Dibbs named her Ena after his wife Tryphena. The vessel was designed by Walter Reeks, a noted Sydney naval architect based in Pitt Street, and was constructed by WM Ford Boat Builders at Berry’s Bay, Sydney. It is reputed that some of her teak fittings had come from the decommissioned Victorian Navy warship HMVS Nelson, which had been cut down and turned into a coal lighter in Sydney in the late 1890s. The steam yacht Ena in 1904 on Sydney Harbour. Ena operated as a private vessel on Sydney Harbour and Pittwater during the early 1900s. In November 1916 the Royal Australian Navy (RAN) purchased the vessel from Dibbs, for £1,000, and converted her to an auxiliary patrol vessel. She was fitted with a single Hotchkiss quick firing 3-pounder gun on her forecastle. Wireless telegraphy equipment was also fitted to enable her to communicate quickly with the RAN wireless stations along the coastline and other Allied warships. She initially used a civilian call sign until allocated her own naval call sign of GVRX. Acting Lieutenant James Ernest Capstick-Dale, RANR was appointed as her commanding officer on 4 December 1916 and Sleuth was commissioned on 18 January 1917. Her second in command was Gunner William George Monteith, RAN. Both officers had prior service at sea during the war; Capstick-Dale as an officer of the watch in the light cruiser HMAS Encounter and Monteith recently returned from German East Africa with two years of service in the light cruiser HMAS Pioneer. Her small ship's company consisted of nine ratings including a petty officer, three able seamen, an engine room artificer, two stokers, a telegraphist/signalman (who was also paid an extra allowance of six pence a day to act as the officer’s steward) and a cook’s mate. Most of her crew were RAN Reserve ratings and attempts by Capstick-Dale to obtain an extra officer for watch-keeping duties and an officer’s steward were not supported by Navy Office, in Melbourne, nor was a later attempt to employ a Torres Strait islander as a steward. Sleuth was based at Thursday Island from where she conducted patrol and shipping examination duties in Torres Strait. While some Australians at the time considered Thursday Island (TI) a ‘backwater’ the reality was it was strategically important for shipping traveling to the east coast from Southeast Asia and vice versa. TI was a major refueling port and Burns Philp & Co Ltd had a number of coal hulks moored in the harbour. Additionally Burns Philp operated several pearl luggers in the area harvesting the lucrative pearl shell for the production of buttons. A raider attack on Thursday Island or the mining of the Torres Strait would have had a major effect on Australia’s economy. HMAS Sleuth sailed from Sydney on 6 February 1917. She encountered bad weather near Seal Rocks and suffered some damage and several bags of coal, stored on her upper deck, were washed over the side. Sleuth put into Brisbane on 9 February for repairs and to take on fresh provisions, water and coal. She departed Brisbane on 16 February and again encountered bad weather. Capstick-Dale anchored the ship most nights in order to transit some of the more dangerous coastal waters in daylight. She arrived at Townsville on 20 February where more coal, provisions and water were taken on board. After sailing from Townsville on 24 February she steamed to Cooktown arriving there late on 25 February to yet again embark more coal. She sailed from Cooktown the next day and arrived at Thursday Island late on 27 February. Capstick-Dale reported that Sleuth was ready for patrol duties on 1 March 1917 and she commenced her first patrol of the Torres Strait on 5 March. It was on this inaugural patrol that Sleuth ran aground on the night of 10 March. While transiting the passage between Moa and Badu Islands she grounded on a sandy shoal near Clarke Island. The tide was falling and Capstick-Dale put out two anchors in an attempt to winch the vessel off the sand but to no avail. The crew then improvised wooden struts to prop up the ships sides to prevent her falling over onto her bilge as the tidal waters receded. When it became obvious that Sleuth could not be removed from the shoal, Capstick-Dale sent the Sleuth’s boat, under command of Gunner Montieth, to Badu Island (some four miles away) to obtain assistance from the owner of the Papuan Industries Station which had a motor schooner and lighter. The plan was to unload all stores and coal from Sleuth into the lighter in order to lighten the ship and then tow her off with the motor schooner. At 6am on 11 March the high tide refloated Sleuth and they met their ‘rescue’ vessels shortly after. Mr Walker from the Papuan Industries Station chose not to charge the Navy for the ‘call out’ of his vessels. Sleuth returned to Thursday Island and local divers were employed to inspect the ship’s hull where it was found that several feet of copper sheathing had been torn but the wooden hull remained intact. Sleuth was slipped during 17-18 March for repairs and then returned to her patrols. The Naval Board noted the poor quality of charts for the region and directed Capstick-Dale to be ‘more careful in the future’. As Sleuth settled into a regular patrol routine it became obvious that she was unsuitable for such work in the tropics. As she operated a coal fired boiler, which enabled her to steam at only 10 knots, the working conditions for her engineers in tropical waters were far from pleasant. Additionally, due to her size she had no refrigeration for food storage and her fresh water storage capability was limited. Overall the climate and very cramped living conditions in what was effectively a harbour luxury yacht were difficult for the ship's company. Despite this she was to spend six months operating in the Torres Strait. HMAS Sleuth on patrol in the Torres Strait during 1917. Note the Hotchkiss 3-pounder quick firing gun on the forward deck. The patrols by Sleuth were regular and monotonous as she steamed throughout the scattered islands in the strait. Generally she would anchor off uninhabited islands and send a landing party ashore to search for any signs of enemy activity. On inhabited islands the landing party would interview any white civilians (such as missionaries, schoolmasters or business owners) to gather information on ship movements and any irregularities in the normal pattern of island life. The ship would remain at anchor overnight and then move on the next day to another island and repeat the activity. Patrols were normally of five to seven days duration after which Sleuth would return to Thursday Island to restock coal, provisions and fresh water. These patrols were also to check for any activity by the German raider SMS Wolf which was active in the Indian and Pacific Ocean during 1917. Wolf later laid a minefield off South Eastern Australia which claimed the cargo vessel Cumberland in July and two mine fields were sewn in New Zealand waters sinking two ships. Wolf sank four more ships north of New Zealand but of more concern was the capture, In August 1917, of the SS Matunga while enroute from Sydney to Rabaul in New Guinea. The raider SMS Seeadler had also entered the Pacific Ocean in 1917 sinking three vessels before she was wrecked on Mopelia Atoll in the Society Island group. Additional defence in the Torres Strait area was provided by three 6-inch guns sited on Thursday Island, at Green Hill Fort, and manned by 50 personnel of the Royal Australian Garrison Artillery. The fort was constructed during 1891-93 and was operational until 1927. The islands wireless station was also a vital part of Australia’s coastal radio network and used to relay messages to the Australian garrisons in New Guinea, warships and coastal shipping. In 1917 it was operated by the RAN Radio Service and protected by a detachment of sailors from the RAN Brigade. The Naval Brigade detachment also operated some small motor boats in the Strait but they had limited range and only small arms as weaponry. All naval forces in the region reported to the Sub-District Naval Officer at Thursday Island who, during 1916-1918 was Lieutenant John Denzil Turner, RAN. 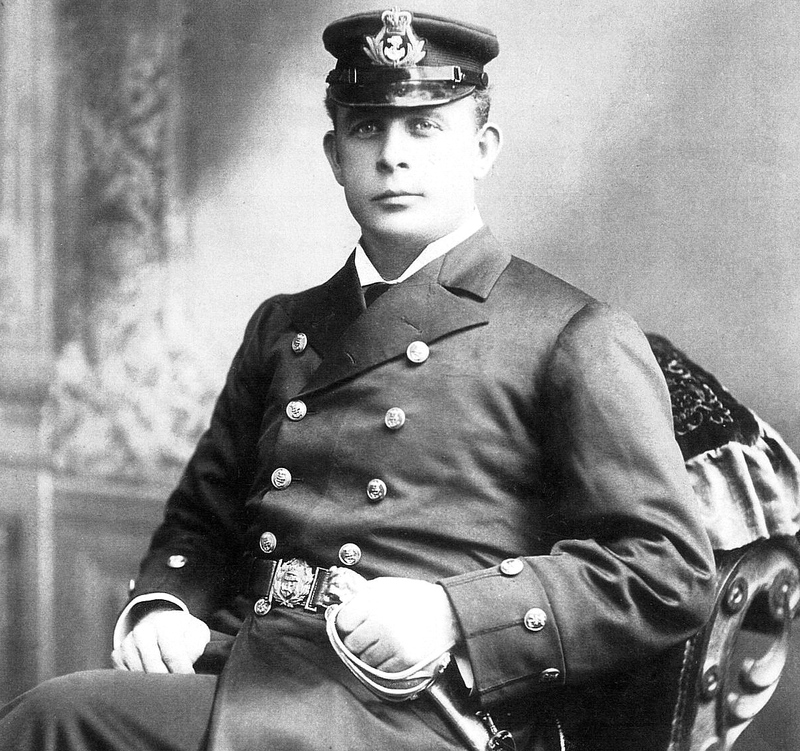 Turner was a tough and highly experienced officer with prior service in the South Australian Navy and active service on board HMCS Protector during the Boxer Rebellion, in China, in late 1900. John Denzil Turner, Sub District Naval Officer at Thursday Island during 1916-1918. Patrols during April and May were routine and without incident but on 16 June 1917, in the vicinity of West Island, Sleuth struck an uncharted coral outcrop. Her crew had been using the ship’s lead line to check the depth of water, which had regularly been 4-5 fathoms (24-30 feet), when suddenly she struck the coral outcrop which was later surveyed at being only four feet below the surface. The ship started taking on water and her three bladed propeller was badly damaged with one blade almost broken off. Capstick-Dale reduced the ships speed to five knots and she limped back to Thursday Island for repairs. Lieutenant Turner organised for the hire of the civilian motor boat Wenonah, to be manned by members of Sleuth’s crew and RAN Brigade personnel, to conduct patrols while Sleuth was undergoing repairs. Sleuth was slipped at the Shiosakis boatslip for extensive repairs and these were completed by 30 June although her propeller blades were still somewhat distorted and a request for a replacement propeller to be shipped from Sydney went unanswered. On the night of 3 July, at high tide, Sleuth was unslipped but in doing so she collided with two luggers that were anchored in the bay. The luggers Waikare and Taniwha were anchored, but not showing any anchor lights, and suffered some damage which was the subject of ongoing correspondence between the Navy and the owners for several months to come. Lieutenant Turner conducted an inquiry into the grounding of 16 July and, while the paucity of reliable charts was a major factor in the incident, Lieutenant Capstick-Dale was considered to be at fault for not using a masthead lookout to spot the coral outcrop. Sleuth’s patrols for July and August were without incident. On the evening of 1 September Sleuth proceeded to sea on patrol. Bad weather was encountered and her air pump and condenser broke down which caused the ship to lose steerage way and almost broach. Her crew managed to get her back into port early on 3 September where repairs kept her out of service for several days. Capstick-Dale organised the hire of the civilian motor boat Wenonah, manned by members of Sleuth’s crew and RAN Brigade personnel, to conduct the patrol instead. RAN Brigade personnel on parade at Thursday Island in 1917. The string of bad luck was not over for Sleuth. On 15 September she was alongside the main jetty at Thursday Island when a fire broke out in the after hold. Only three of her crew were on board at the time with three others in hospital and the remaining five at sea on patrol in the motor boat Wenonah. The after hold contained most of the ships stores, ammunition and wireless equipment and the fire was quickly put out by her crew assisted by six Torres Strait Islanders who were working nearby. The cause of the fire was attributed to the spontaneous combustion of one of the ships calcium flares which had been affected by salt water and humidity. The six Torres Strait Islanders who had assisted to put out the fire were later paid five shilling each by the Navy for their efforts. Lieutenant Capstick-Dale formally advised Captain John Glossop, his immediate superior, in Sydney that Sleuth was totally unsuited for service in the Torres Strait and that the crew were reluctant to sail in her as they considered her unsafe. He further stated that a large vessel with a high speed would be best suited for patrol duties in the region while Sleuth could be retained for the examination of transiting merchant shipping. On 22 October 1917 the Naval Board directed Sleuth to conduct an extensive patrol along the coast of north Queensland from Thursday Island to Cooktown before returning to Sydney. This search was to look for any sign of activity from the German raider Wolf and also for the missing Burns Philp steamer SS Matunga which had failed to arrive in Rabaul in early August 1917. Matunga had actually been captured by Wolf on 6 August but her fate was not known until January 1918 when a message from one of her crew, stating the ship had been captured, was found in a bottle in the Celebes Sea. Matunga was sunk by the Germans on 26 August 1917 in New Guinea waters but despite this, rumours persisted that she had been seen in north Queensland waters. 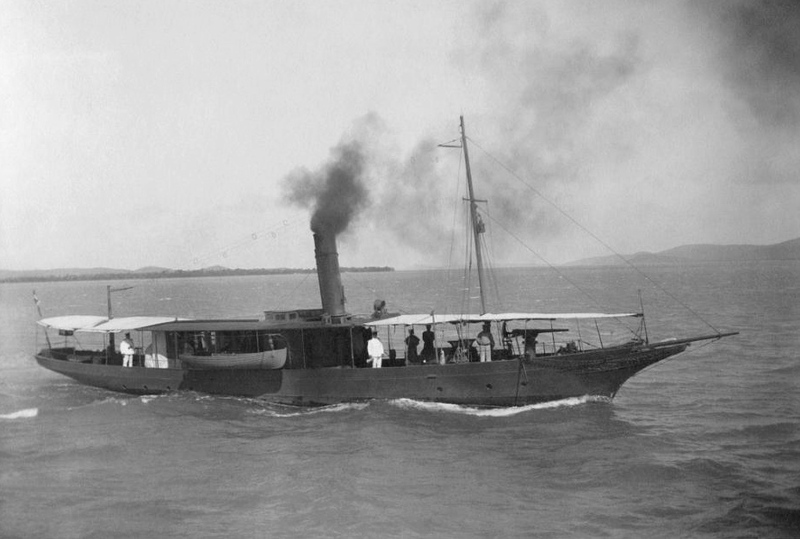 The motor boat Wenonah was then rehired, by Lieutenant Turner, to replace Sleuth and undertake the regular patrols in the Torres Strait. This motor boat, hired from the Torres Strait Fresh Food and Ice Company and had been used to conduct patrols prior to Sleuth’s arrival. She was manned by RAN Brigade personnel with her civilian engineer retained on board. This boat provided the patrols in the Torres Strait until the 1350 ton steamer HMAS Mourilyan arrived in June 1918 to take on the task. This larger vessel with a crew of nearly 60 men was a far better choice for patrols duties in the Torres Strait. Captstick-Dale took Sleuth to sea on 24 October and inspected Newcastle Bay and Turtle Head Island that day. On 25 October Sleuth proceeded to inspect Temple Bay, Weymouth Bay, the Pascoe River (the entrance of which was found to be blocked by a sand bar), Restoration Island, Albatross Cove and she then anchored overnight at Burke Reef. On 26 October she inspected Princess Charlotte Bay and islands in the Flinders Group. On 27 October Sleuth inspected Bathurst Bay but was forced to anchor near Pipon Island due to bad weather. The following day she checked islands in the Horwick Group before anchoring off Cape Flattery. The next day she arrived at Cooktown having found nothing unusual during her 700 miles of steaming (noting the distance from Thursday Island to Cooktown is normally 410 miles if conducted expeditiously). Sleuth sailed from Cooktown on the morning of the 30th and proceeded to Cairns where she arrived that evening and took on coal, water and provisions. She also cleaned her boilers before departing on the morning of 2 November and arriving in Townsville on 4 November. An overhaul of her engines was undertaken at Townsville and on completion she sailed south to Rockhampton. 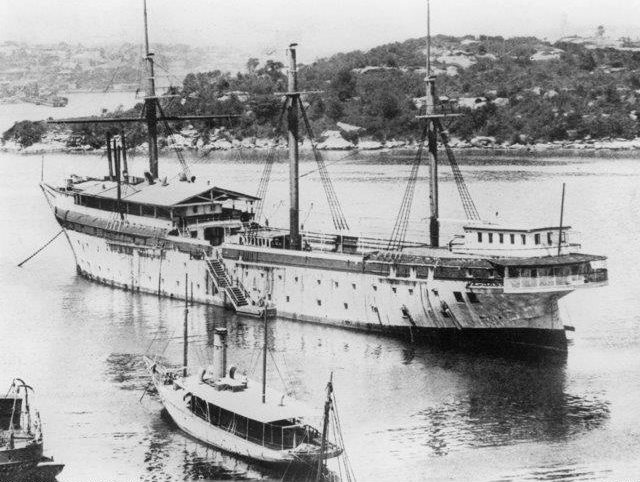 Sleuth was delayed in this port, as her two stokers were admitted to hospital and had to be replaced; she did not depart Rockhampton until 22 November. Sleuth arrived in Brisbane in late November 1917 and Lieutenant Capstick-Dale handed over command to Lieutenant Percy Valleck Hugo RANR (S) before departing the ship to join the light cruiser HMAS Psyche on 25 November. Psyche had been recommissioned in October 1917 to conduct patrols along the east coast in response to the threat posed by the Wolf. Lieutenant Hugo took Sleuth to sea on 28 November bound for Sydney but, while the vessel was under the charge of the Brisbane port pilot, she ran aground again that evening near Moreton Island. The vessel was refloated the next day before continuing her passage to Sydney. Sleuth finally arrived in Sydney in early December 1917 and Lieutenant Hugo handed over command, on 10 December 1917, to Chief Gunner Arthur ‘Doggo’ Brown, RN. Brown had recently returned to Australia after five years of service in the light cruiser HMAS Melbourne including war time service in the Caribbean and North Sea. Sleuth was also temporarily decommissioned and entered dry dock at Cockatoo Island for a short refit. She was recommissioned, on 17 December 1917, as a tender to the boys training ship HMAS Tingira with a ship's company of RAN personnel instead of reservists. 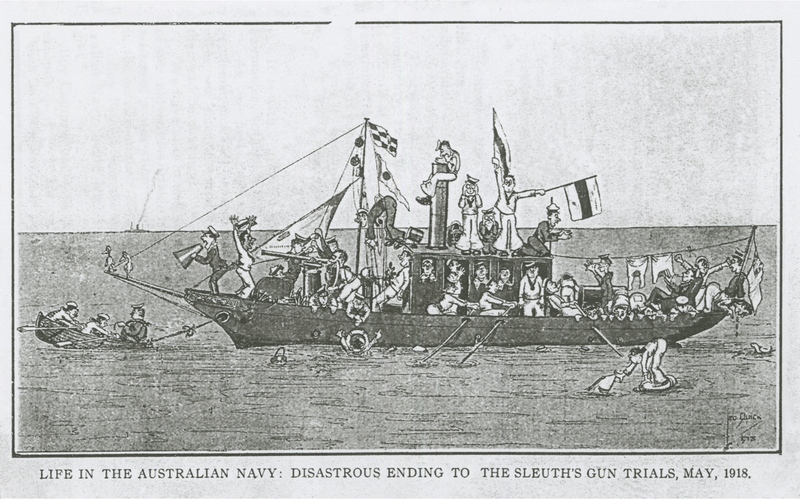 Cartoon of HMAS Sleuth during a training exercise for Tingira boys in May 1918. Despite her perceived inadequacy, as a training vessel Sleuth continued to support training for Tingira boys during 1918-1919. During March-July 1919 Sleuth also operated as a patrol vessel off the North Head Quarantine Station to oversee the arrival of returning troopships and enforce quarantine restrictions due to the worldwide Spanish Influenza pandemic. Many returning soldiers carried this disease and required a period in quarantine before being allowed to be demobilised. For many of these soldiers the enforced quarantine period, after several years away from home, was difficult and Sleuth was required to ensure that men did not attempt to break out from the quarantine station; either on their own or with assistance from others. In mid-1919 the Commanding Officer of Tingira, Commander Henry Feakes, RAN advised the Commodore in Charge - Sydney that Sleuth was being employed only one day per week taking classes of boys to sea for practical experience in steering the ship (helmsman duties) practical rule of the road training, heaving the lead and other seamanship activities. He further advised that the vessel was of limited use and did not justify the expense of its upkeep but that he still required a seagoing tender for training purposes but a steam cutter would be more appropriate and cheaper. As a result Sleuth was put up for sale in late 1919. HMAS Tingira with HMAS Sleuth (Tender) in foreground, circa 1919. HMAS Sleuth was decommissioned on 19 February 1920 and sold for £1,350 to the Waterside Ship Chandlery Company. Her career over the next 90 years was quite eventful and ownership changed a number of times. Renamed Ena she was owned by businessman William Longworth and operated between Sydney and Newcastle and was regularly seen on the Karuah River, taking Longworth to his property Glenroy at Port Stephens. After Longworth’s death in 1928 the vessel was sold to Vernon Arnfield. In the early 1930s he sold Ena to Walter Driscoll who used her to transport apples from Tasmania to other ports on the island as well as the mainland, however this venture eventually failed. Ena was employed on various piecemeal tasks before she was purchased in 1940 by the Roche brothers (Colin, Bill and Max), renamed Aurore, and modified for trawling and scallop fishing. Her stem was reduced in length, a diesel engine installed in 1945, and facilities for storing fish (including refrigerated storage and a wet well) were fitted. She operated in Tasmanian waters and sometimes as far afield as Queensland. The Roche brothers finally sold Aurore in 1974 to another Tasmanian fisherman Ben Hursey who in turn sold her, in 1980, to abalone fishermen Noel and Geoff Harper. On the night of 4 March 1981, Aurore sank in the D'Entrecasteaux Channel after striking a submerged object (possibly a shipping container). The vessel was salvaged some four months later and slipped at the Domain Wharf in Hobart. In February 1982 a Sydney based syndicate funded by businessman Pat Burke, stockbroker Rene Rivkin, and solicitor David Baffksy purchased the vessel for $120,000 and had her restored, by shipwright Nick Masterman, to as near as possible to her original condition. An 80-horsepower compound steam engine (from the former Derwent River ferry Excella) was used to replace the 1945 vintage diesel engine. The yacht was given her original name Ena and returned to the water in 1986. During 1987-88 Ena circumnavigated Australia and visited Western Australia for the 1987 America's Cup. On return to Sydney, Ena was used for private charter cruises until being seized by creditors. She was sold to new owners in 1991 and operated in Sydney Harbour. Ena was relocated to Melbourne in 2014 and was operating on the Yarra River and in Port Phillip Bay until early 2016 when she returned to Sydney. Ena was later bought by a new private owner and in mid-2017 she was donated to the Australian National Maritime Museum, where she is now part of the operating fleet and National Maritime Collection. 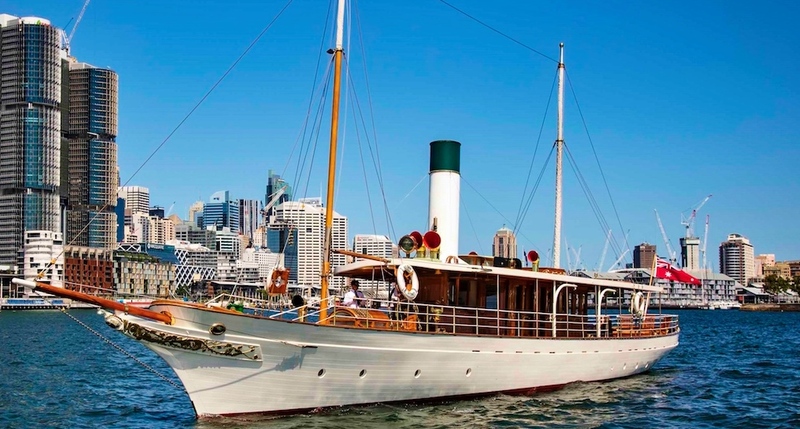 The Steam Yacht Ena is also listed on the Australian Register of Historic Vessels and is the only World War I era commissioned RAN vessel still afloat. The Australian National Maritime Museum heritage vessel, the Steam Yacht Ena in 2017 (formerly HMAS Sleuth 1917).